The Policy Institute publishes its outputs in the series Studies in Public Policyor "Blue Papers", which provide short, rigorous, but accessible analyses of policy issues of major importance. The aim of the series is to promote active debate and engagement between the academic and policy communities and to support the analysis and development of effective policy solutions. 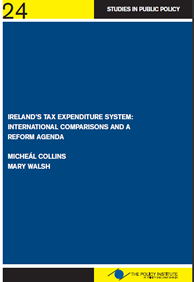 Printed copies of Blue Papers are also available for purchase from the Policy Institute at a cost of €10. To place an order please email policy.institute@tcd.ie indicating the Blue Paper title, reference number and required quantity. Policy Institute Working Papers are designed to ensure rapid dissemination of public policy research to stimulate debate and enable feedback before the author finalises his or her policy conclusions. Last updated 28 November 2012 policy.institute@tcd.ie .